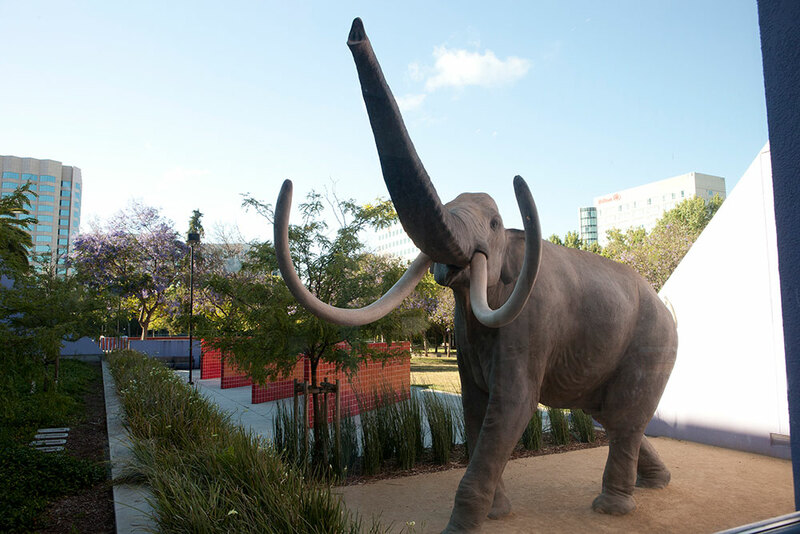 Find out more about visiting the Mammoth Discovery! in person (including hours, admission and location information) at the CDM information page. Try the Mystery Bone activity! Exhibit developers and researchers working on this project have been particularly interested in the idea of evidence, and how adults can encourage children to use evidence to explain things that they observe. In this technological age, where children are confronted with information from so many sources, the idea of being able to understand and grapple with evidence, check sources, and argue one’s position with supporting evidence becomes increasingly important. Helping children begin to think beyond the discovery, to begin to ask questions and to want to find out more is the purpose of this exciting new exhibition. Because one day, one of the children who visits Children’s Discovery Museum is bound to make the next important discovery that will change the course of history! 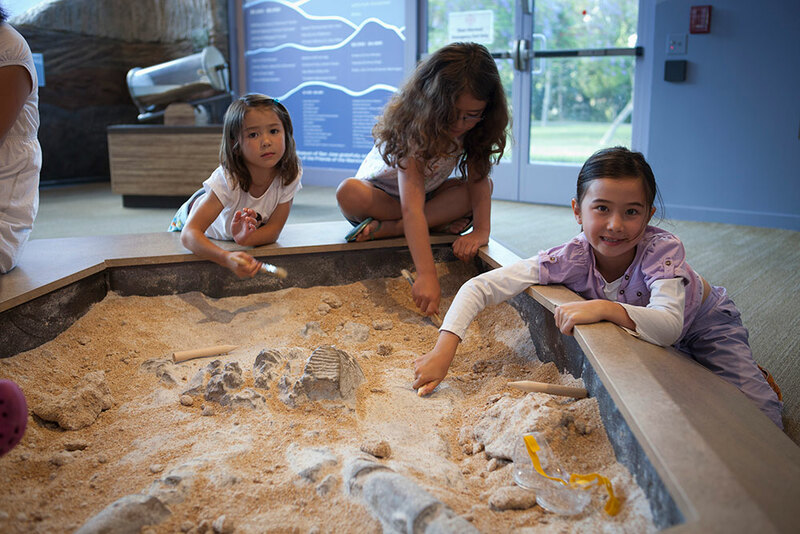 After being greeted by Roger, via video, children can begin their own fossil discoveries, digging in the riverbank to uncover bones, using brushes, simple chisels and safety glasses, just like paleontologists. A simple glance through the nearby window lets children imagine how San Jose might have looked during that time long ago, as they will glimpse a 13-foot tall mammoth peering back at them from outside, and a large berm shows different sedimentary layers that might be found here in the Bay Area. 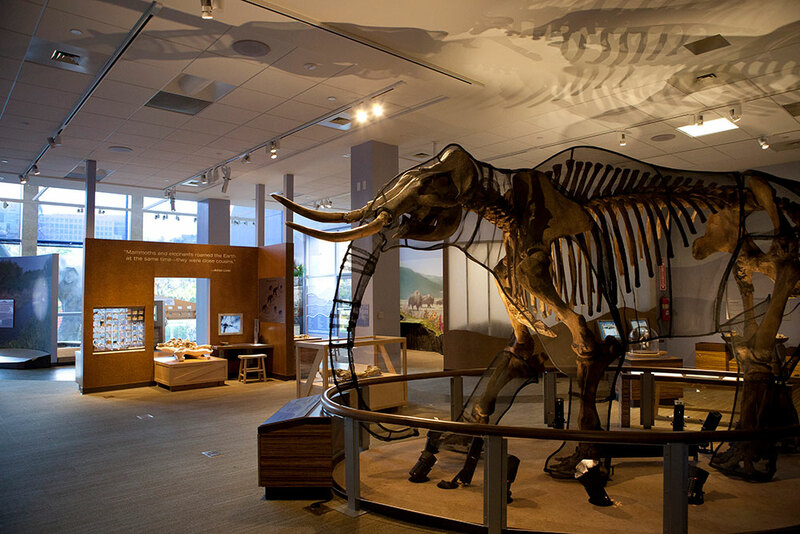 Opportunities to see the actual fossils, discovered just two miles away, will delight children and adults alike as they begin to identify the skull, teeth, and tusks of Lupe. A small model of the skull helps children to understand the orientation of the fossil, and how it would have fit in the mammoth’s head. Magnifiers provide a closer look at fossil dung that shows what plants grew in the area and provided the diet for the mammoths. Young scientists can enter a lab-like environment that encourages them to find out more about the fossil bones. Using careful observation, comparison with other fossils and evidence from animals living today, children will notice that mammoth teeth look a lot like the bottom of a sneaker, that mammoth leg bones are at least twice the length of their own leg bones, and that mammoth tusks grew from the inside out, adding rings for seasonal growth, just like trees do. Puzzles of bone fragments and a scale comparing the weight of familiar items in a child’s life to the weight of a mammoth provide more information for inquiring minds. But the centerpiece of this area is the full size skeletal replica of Lupe, the mammoth. Scientists used the three bones that were discovered (skull, pelvis, and femur or thigh bone) to recreate a full skeleton of this magnificent creature. Dramatically lit and standing a full nine-feet tall, the replica inspires both awe and wonder. Children ask: How did this mammoth look when it was alive? When did it live? Why do the front legs bend backwards? Why were the tusks so long? 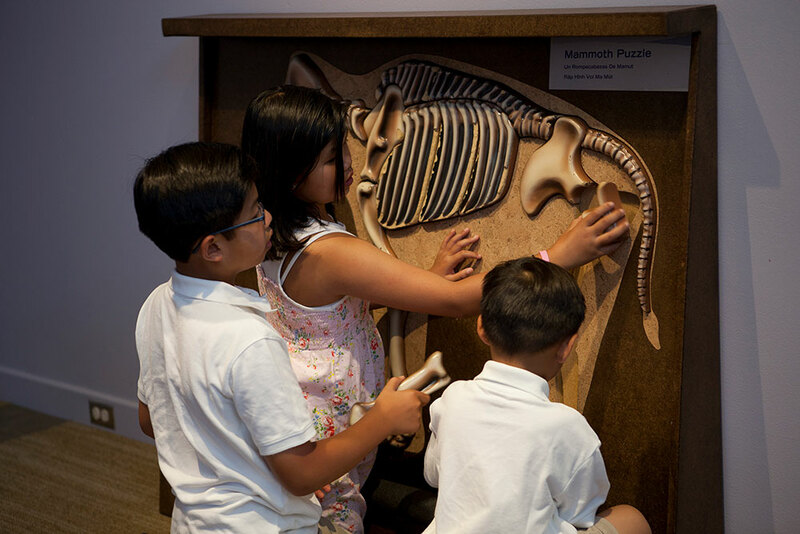 Slides and a lightbox nearby encourage children to compare the skeletons of other animals to Lupe’s while an interactive touchscreen features conversations with local paleontologists and geologists who helped excavate the fossils and analyze the surrounding soil.